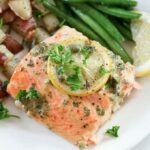 This Dijon Lemon Caper Salmon dinner is flavorful as it is delicious. Salmon lovers can rejoice with Dijon, lemon and caper flavor infused into melt-in-your mouth fillets of salmon. Served with roasted dill red potatoes and green beans, this dinner is sure to be a new family favorite! Salmon and Marinade: Arrange fillets in a 8 x 8 inch or 9 x 13 inch baking pan. In a medium-small mixing bowl, mix 2 tablespoons olive oil, 2 tablespoons fresh squeezed lemon juice, 2 tablespoons Dijon mustard, 1/4 up chopped parsley and 1-2 tablespoons drained capers. Spread over the top of the salmon until fully coated, add lemon slices if desired and a tablespoon of butter over the lemon. Cover with wrap and refrigerate for a half hour or longer (you can also marinate overnight). You can start baking the salmon in the last half hour that the potatoes are baking. Roasted Red Potatoes with Dill: In a large mixing bowl, mix cubed red potatoes with 1 teaspoon dill, 2 tablespoons olive oil, salt and pepper until coated. Arrange on a foil-lined baking sheet in a single layer. Bake at 350 degrees for 60 minutes, stirring at 30 minutes along. If potatoes are tender when inserted with a fork you can take them out earlier. Roasted Green Beans: On a foil-lined baking sheet, pile the green beans, pour 1-2 tablespoons olive oil and season with salt and pepper. Mix with your hands and arrange in a single layer. Bake at 350 degrees F for 20-25 minutes. You can put the green beans in 20-25 minutes before the red potatoes are done. If you do not have enough room in your oven, you can just do one of the components of the recipe earlier or have one going in a toaster oven that has baking capability. For serving, add freshly sliced lemon wedges, fresh chopped parsley and salt and pepper to taste. Enjoy! If you are wondering about which rack to put each component on, I would suggest the salmon on the middle/upper portion of the oven and the potatoes middle/upper and the green beans on the middle/lower. This recipe for Dijon Lemon Caper Salmon was printed from AmandasCookin.com - https://amandascookin.com/dijon-lemon-caper-salmon/ and can only be printed for education or personal use.